Duane seeks to be a leader in both business and civic life in Austin, having served on The Board of Directors of The Paramount Theatre, past President of The Young Men’s Business League, The Austin Investment Association, and member of the Estate Planning Council of Austin. Duane has a BBA in Finance from Arizona State University. He holds a CERTIFIED FINANCIAL PLANNER™ professional designation and Series 7, 8, 63, and 65 securities registrations and a General Lines Insurance License. Duane has 38 years of experience in the financial services industry. He has been married to Meredith for 40 years and they have 3 children. 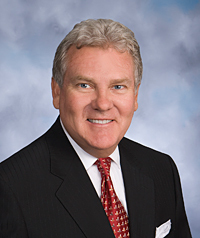 Duane started in the financial industry in Austin TX in 1977 and took an early interest in the process of investment planning; he was awarded his CFP® certification in 1982. Wealth and estate investment planning continues to be a large part of his practice. Duane's passion is a nonprofit founded by his wife called Wonders and Worries which helps children cope when a parent has a life threatening illness.